With years of experience in the field of credit repair and monitoring, Lexington Law is premium option for improving your credit score after consolidating debt. Of course the first move when debt threatens to pull you into a downwards spiral is to consolidate your debt and settle on a repayment cycle you can live with. Lexington Law is the perfect service to introduce to your finances after making this shift, helping give you the final push into financial freedom. While Lexington Law is excellent at helping you repair your credit and improve your score, one of the areas where it could improve is identity theft deterrence. The company offers FICO score tracking for its top tier subscribers, however, its standard offer is monthly credit monitoring along with personalized reports on your credit health. These reports use Lexington Law’s own five-feature analysis and give you a clear idea of where your credit score stands. In spite of some issues with identity protection, we found that Lexington Law still offers plenty of value when it comes to keeping your identity safe. If you should encounter or discover any fraudulent activity, Lexington Law is one of the best options available in terms of fraud support and restoring your credit. The company offers a variety of services to help you repair your credit, including contacting credit bureaus directly to challenge items that should not be on your reports. Additionally, Lexington Law will intervene with creditors, and provide you with tools to remove unfair items on your report. To help you stay on top of changes, you are entitled to receive education on how your credit is affected. Finally, as a user, you are eligible to receive alerts by email or SMS whenever there is suspicious activity on your credit. Overall, protecting against fraud and restoring your credit is an incredibly simple process with Lexington Law. One area where Lexington Law could catch up with the industry is with its pricing. The company’s pricing sits on the higher end of the industry average. 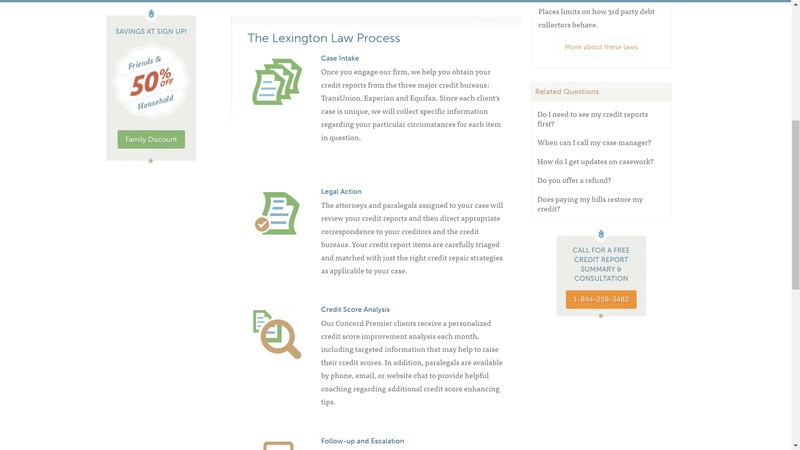 Lexington Law offers three plans: Concord Standard, Concord Premier, and Premier Plus. Concord Standard includes bureau challenges and creditor interventions to help restore your credit. The plan starts at $79.95 per month. The Concord Premier Plan adds monthly credit score analysis, TransUnion Alerts, and tools designed to help you monitor and repair your credit quickly. Concord Premier costs $99.95 a month. Premier Plus adds tremendous value with a FICO Score Tracker, Identity Protection, and a suite of personal finance tools to help you regain control of your funds, all for $119.95 per month. All plans include a one-time first work fee which starts at $99.95 a month, and $119.95 for the Premier Plus option. Another strong suit we discovered in our research is Lexington Law’s outstanding credit education library. The company’s website features a great knowledgebase that gives you information about your credit score and how it is composed, tools to fix your credit, and more information relating to your financial health that can help you make the best decisions possible. Lexington Law offers some great amenities when you sign up for their plans, but they could stand to improve their offerings. Though the company does not offer the ability to live chat with a representative, they are easy to reach via telephone or mail during regular work hours. Additionally, depending on which plan you choose, you get great features to help inform you of changes or updates all while protecting your credit. Besides the service features, the company’s blog offers great insights on credit trends and relevant topics. It does not offer a robust credit-monitoring suite, Lexington Law makes sure you are informed to the extent that you can take control of your credit score. Although it could improve some of its services, Lexington Law is a top choice when you need to repair your credit score. Lexington Law provides you with numerous features designed to help you understand your financial health better and stay protected against risks to your credit. Moreover, Lexington Law will handle the process of helping repair your credit and removing unfair items from your reports. Despite its higher starting price, Lexington Law offers excellent value when it comes to staying on top of your credit.